The Dog Project is moving forward with some new and exciting experiments. Presently, our local dogs are learning scent discrimination for an upcoming study, titled Experiment 9- Olfaction and Cross-Sensory Interactions. During the first stage of the preparation process for Experiment 9, we educate the dogs to nose touch a blue target whenever the handler presents the scent of a particular aromatic oil. We introduce the scent manually via a q-tip. 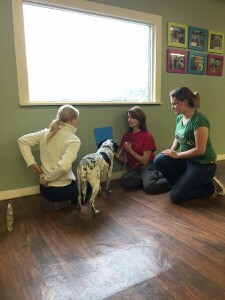 Then, we incorporate physical and/or verbal cues along with clicker behavior shaping protocols until the dogs independently and reliably touch the target immediately upon exposure to the scent. During the latter stages of Stage One, we move the dogs further from the target and wean all physical and verbal handler cues to ensure that the dogs competently understand the relevance of the scent and the mechanics of the indication task. 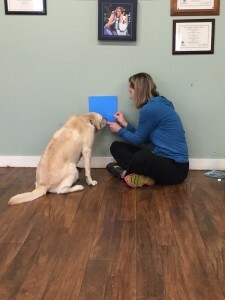 Project volunteer Diana Delatour teaches her dog, Truffles, the Stage One olfaction protocols. Dory, an Emory neuroscience student assists with the clicker, while Emory PhD candidate Ashley Prichard supervises. During the second stage, we randomly integrate a blank q-tip, so that the dogs with greater certainty learn the prepotence of the olfactory stimulus, as opposed to emphasizing the visual stimulus of the q-tip. The dogs receive a reward either by touching the target upon exposure to the scented q-tip or by remaining stationary upon exposure to the blank q-tip. They do not receive a reward for a false-positive (touching the target after exposure to the blank q-tip) or a false-negative (not touching the target upon exposure to the scented q-tip). Once the dogs achieve a minimum of 80% reliability in the two conditions, we progress to Stage Three. During the third stage, we introduce a second relevant odor and teach the dogs to nose touch a yellow target when detecting the odor. Since the dogs are already familiar with the mechanics of the indication behavior, Stage Three tends to progress more quickly than Stage One. During the fourth stage, we place two targets on the wall, one blue and one yellow, place the dogs between the two targets and approximately two feet from the wall, and expose them to three conditions: 1) Scent one, 2) Scent two, and 3) Blank q-tip. We expect the dogs to touch the blue target when exposed to the scent one q-tip, touch the yellow target when exposed to the scent two q-tip, and to remain static when exposed to the blank q-tip. They are clicked and rewarded for all correct behaviors. During the fifth stage we remove the q-tips and instead present the scents via an olfactometer constructed by Emory Neuroscience PhD Candidate Ashley Prichard. Otherwise, all requirements are the same. The dogs must touch the blue target when detecting scent one, the yellow target when detecting scent two, and remain stationary when detecting clean air or an interferent scent. Once the dogs are proficient (>80% accuracy) with all Stage 5 conditions on the floor, we progress to the final preparatory stage. CPT Trainer and Project Volunteer Patricia King teaches Kady the Experiment 9 Stage One olfaction protocols. During the sixth stage, we practice in the mock MRI bore and inside the mock MRI coil at CPT. We also replace the large wall targets with small wood targets placed anterior to the coil chin rest. Once the dogs are proficient at touching the correct targets upon scent exposure from the olfactometer, we add the MRI scanner environmental conditions of noise and vibrations. We also then require that the dogs wear ear protection. 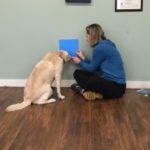 Since the majority of the dogs have completed prior experiments on inhibitory control and working memory that employed wood targets anterior to the chin rest, we expect the transition to progress quickly. Once the dogs become proficient during a full scanner dress rehearsal at CPT, we approve them for a live fMRI scan on the Emory University campus. The objectives of Experiment 9 are to observe brain activity during a canine olfactory discrimination exercise and to determine whether there is olfactory-visual cross-sensory activity upon exposure to either cue in the absence of exposure to the corresponding sensory stimulus. The experiment has pertinence for better understanding the sensory and cognitive operations of military and law enforcement explosives and narcotics detection dogs and for ultimately improving the training protocols for scent detection dogs. In the case of an explosives detection dog, a false-negative may cost lives and frequent false-positives may cause the handler to mistrust the dog’s accurate indications, which also may cost lives. With narcotics dogs, a false-negative may result in a lawbreaker escaping arrest. Even worse, a false-positive may cause an officer to inappropriately arrest an innocent citizen, which with present drug laws may also foment the insidious actions of asset forfeiture. Consequently, our experiment has the potential to make Americans safer from the standpoint of both their person and their property.